Olivier’s Captain Ahab-like fixation on one of the most dubiously heroic of tragic heroes has been shared for centuries not just by the actors who have played Hamlet but also by the theatergoers who have seen them. In the more than 400 years since Richard Burbage originated it in London, the role of Shakespeare’s existentially challenged prince of Denmark has become the ultimate prize in a sort of eternal Olympics of acting. Even before I read the play, I was attracted by the image of the man in black, in pensive profile, holding a skull. My grandfather taught Shakespeare and owned many tempting, illustrated volumes on the subject. 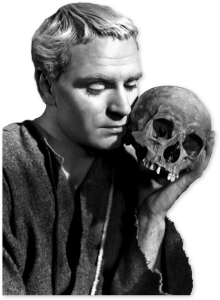 I didn’t see any kind of performance of “Hamlet” until I was 11, when I attended a school screening of Olivier’s film version. It was a day I shall always remember, because it coincided with the death of my beloved white mouse, Fiona, and all that tragic melancholy seemed to give grandeur to my own. Even then, on some level, I was aware that you really needed to be with “Hamlet” (and Hamlet) in the solid flesh for full impact, that the oxygen he required to come fully to life could be found only on a stage. So while I’d seen Olivier’s Hamlet, I had also missed out on Olivier’s Hamlet. That didn’t stop the specter of that performance from feeling as real, and as elusive, to me as his murdered father’s was for the young prince. Those same phantoms, I imagine, are much on the mind of Benedict Cumberbatch these days. Though more than a year away, his Hamlet (at the Barbican in London) has already prompted much heavy-breathing speculation; it follows celebrity interpretations during the past decade that include those of Jude Law, David Tennant and Rory Kinnear. In anticipation of that event, I have imagined a fantasy arena in which a Battle of the Hamlets might take place. Because the number of Hamlets past is beyond counting, and records of long-ago incarnations are on the sketchy side, I am limiting myself to those since 1922, for which documentation is abundant, and to the interpretations that generated the greatest hue and cry. They must also have been reckoned to have had a touch of the greatness that inspires rapture, shock and derision.